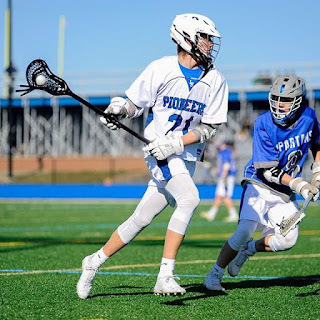 On this past Tuesday, the Lampeter Strasburg Lacrosse team scored a victory against the Garden Spot Spartans Lacrosse team. After already facing Garden Spot a few weeks before, the Pioneers knew what to improve on in the following game. However, both teams were thirsty for a victory in the Lebanon League. In the first game, the Pioneers gained a lead and managed to keep the Garden Spot Spartans at bay. The Pioneers ended up winning this game. In the second game against Garden Spot, the Pioneers started the game off strong and put up one goal after another. After a 12 minute quarter of solid play, the Spartans tried turning things around. The Garden Spot Spartans managed to possess the ball for most of the second quarter, allowing them to put up a few goals. As the third quarter rolled around, the Pioneers seemed rejuvenated and ready to play. L-S managed to put up another 6 goals. It was no easy game to play on Friday, April 12 for the Lampeter-Strasburg girls' lacrosse team. What started as a mere drizzle quickly turned into a pouring rain during their home game against Hempfield High School. The varsity team started off the evening with a slight drizzle infiltrating them for a majority of the game. And unfortunately for the varsity team, the rain got in the way of their victory as they fell to Hempfield that night. However, the story does not end there. Following the varsity game, that evening there was the JV game. The team came back with a vengeance. As more and more people began to exit the soggy stands, and as the rain began to fall harder and harder, the girls had to bring their A-game. The Future Nurses Club (a.k.a. Scrub Club) is the perfect group for any student who would like to be involved with the medical field in the future. The club brings in speakers that hold discussions with students on informative topics pertaining to the medical field, enrich the members with statistics, and show medical devices that are used in multiple health departments. The Future Nurses Club is not only for anybody wanting to pursue nursing, but the club also tries to expose participants to all areas in the medical field like physical therapy, pediatrics, and much more. This month, Scrub Club is aiming to raise awareness on organ donation through spreading information to the staff and students of L-S. They will have booths set-up at sporting events where they will be selling T-Shirts and giving information out about organ donating. To learn more about organ donation and the processes involved, visit organdonor.org.